He was a respected scientist and ‘born sceptic’… so just how did a Cambridge-educated son of a General become Britain’s grandest ghostbuster? Until 1977, life at 284 Green Street in Enfield, North London, was rather mundane. The semi-detached council house with a bay-windowed sitting room, freshly-painted front door and garish wallpaper was home to Peggy Hodgson, a plump, over-stretched divorcee with four exuberant children — Margaret, 12, Janet, 11, Johnny, ten and Billy, seven. Then one evening at the end of August, everything changed. Janet and Margaret were in their bedroom play-fighting beneath posters of John Travolta, Gary Numan and Prince Andrew, when the furniture started moving. Janet’s bed shook. A chest of drawers slid four feet across the room, blocking the door. They screamed for help and Peggy rushed upstairs and pushed it back in a panic. It moved towards her again and this time it wouldn’t budge — held as if by an inhumanly strong force. That was just the start. Over the next 18 months, tables would flip, beds vibrate, sofas levitate, walls echo and everything from Lego to plates, crockery and bricks — all strangely hot to the touch — would fly through the air at number 284. Terrified, Peggy dialled 999. Carolyn Heeps, one of the officers who answered the callout, arrived just in time to see a chair lift off the sitting room carpet and move towards her. When the police could do nothing, Peggy phoned the press who helped turn the Enfield ‘Haunting’ into one of the most talked-about phenomena of decades. Last year, it was the subject of a series starring Timothy Spall and Matthew Macfadyen. Naturally, most people dismissed it as a hoax; a fraud; a huge con. Some claimed it was part of a masterplan by Peggy to secure a better house from the council. Others said Janet and her sister were using ventriloquism to scare people. Finally, Peggy called in the ‘experts’ — the scientifically respected Society for Psychical Research — who sent a researcher called Guy Playfair with his colleague, Maurice Gross, a businessman, to investigate. Playfair was not your average ghost hunter. 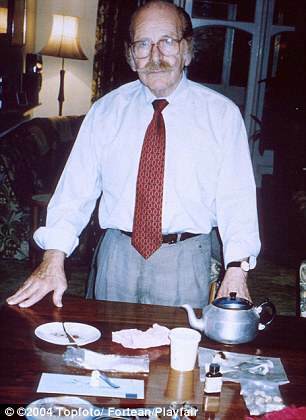 He was an able and respected scientist, a ‘born sceptic’ who wrote painstakingly researched books, spent years proving a telepathic link between sets of identical twins and, after what he called ‘a moment of truth’, was also a believer, supporter and friend of illusionist Uri Geller. But he became a man obsessed, who never once veered from his belief that the phenomena at 284 Green Street were genuine — right up to his recent death aged 83. Playfair risked ridicule, scientific contempt and near bankruptcy in his assertions that Janet — a skinny, toothy, bubbly blonde 11-year-old — was the epicentre of the activity, channelling a poltergeist (German for ‘noisy ghost’). From late 1977 to early 1978, he practically lived with the Hodgsons, logging each hurled kettle and smashed plate and trying to capture every levitation, violent trance and rasping-voiced possession suffered by Janet in their otherwise unremarkable surburban house. In total, he spent more than 180 days at the house monitoring paranormal activity. 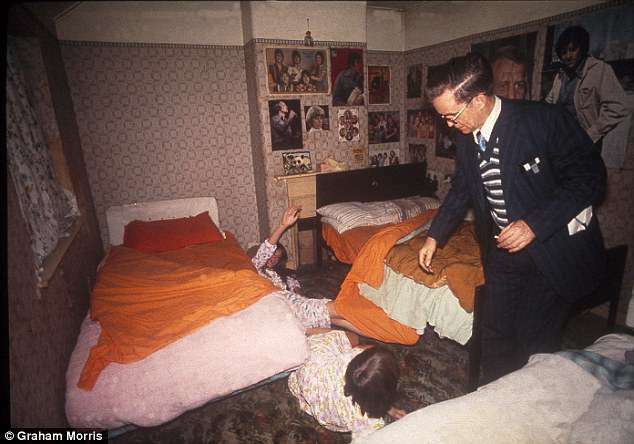 He conducted 25 all-night vigils, recorded more than 2,000 ‘events’ and compiled more than 140 hours of recordings of strange voices, bumps, crashes, snarls and oaths, which formed the basis of his bestselling book — This House Is Haunted: The Investigation Of The Enfield Poltergeist. He struggled with tripods, tape recorders, remote-controlled cameras and video equipment, all of which mysteriously failed. Batteries drained, tapes were wiped, bulbs were shattered. But he never doubted his findings. He was a fantastically bright linguist. After school he went to Cambridge, where he studied modern languages at Pembroke College, wrote for the university magazine and, in his spare time, translated some of Chekhov’s stories into English for the first time. Two years of National Service were followed by a stint working as a translator for the RAF in Iraq. Later came an illustrious career in journalism working for Life magazine and, from his adopted home in Rio di Janeiro, for The Economist, Time, Associated Press, The Guardian and for the press corps of the U.S. Agency for International Development. One of his assignments was an investigation into ‘psychic surgeons’ in Brazil who performed operations without anaesthetics, aided — so it was said — by powers not of this world. Playfair wasn’t a believer, but, suffering from tummy troubles at the time, he found himself entering an inexplicable trance and undergoing two operations conducted by a psychic surgeon called Edivaldo. Despite no anaesthetic, instead of experiencing searing pain, he described feeling ‘a very distinct plop’ the first time the medium’s hands entered his abdomen and ‘a sort of tickling but no pain at all’. With that, he launched into a lifelong study of the paranormal. He joined the Society for Psychical Research and, with two Brazilian researchers, started investigating poltergeists in Sao Paulo, Rio and further afield. He met Maurice Gross through the Society and, together, they jumped at the chance to investigate the bizarre events at 284 Green Street. One day the girl who lived there, Janet, would levitate in full view of a lollipop lady on duty opposite the Hodgson’s house. The next, words were scrawled on the wall in excrement. The sentence I AM FRED appeared in strips of tape pasted inside the bathroom door. The kettle hopped about. The goldfish died. The budgie was killed. An unseen force grabbed Rose’s leg and yanked it behind her. Curtains flew off their rail and whipped around Janet’s neck, almost strangling her. It was almost all about Janet. More than half the reported cases of poltergeists involved children, something Playfair put down to excess energy (Janet was hyperactive), hormonal changes and stress. ‘They are often very young, pre-adolescent children and there is usually some family stress involved — in this case the separation of Janet’s parents. The child can be hyper-sensitive to the stresses and appears to be picking up energy.’ He once described poltergeists as ‘footballs’ — formed when people get upset and exude a kind of vital energy, which in turn forms into droplets, like rain, but lighter and the size of footballs which are then kicked around by spirits, smashing windows and knocking ornaments off the mantelpiece until finally the ball turns into a pool of water. While it all sounds a bit far-fetched, to the point of resembling a Hollywood horror film, Playfair wasn’t alone in his conviction. Graham Morris, a newspaper photographer, had a Lego brick thrown at him. And Janet’s uncle John Burcombe got a shock when he opened the living room door and Janet, who’d been sitting on the sofa, came flying through the air with such force that the door was smashed into his face and his glasses were knocked off. In person Playfair was thoughtful, rather formal, always crisply turned out and, occasionally, eccentric. He never married but had girlfriends and was briefly engaged in the Seventies. He read, listened to the radio, played the trombone, harpsichord and piano, grew roses, favoured jaunty yellow socks and wrote well-informed letters to newspapers on everything from train strikes to his home-baked bread. He was also confident — in his research, his findings and his views — and constantly batted away accusations that he’d been duped by an 11-year-old girl who admitted staging a small number of the hauntings, so as not to disappoint expectant visitors, and hiding his tape recorder. What made Playfair’s beliefs all the more fascinating was his eminent family and impeccable education. It also made his friendship with Uri Geller more surprising. They met in the early Eighties. At first Playfair assumed the illusionist’s ‘special powers’ were faked, but soon changed his mind. Apparently the turning point came when, after conducting experiments with Geller at the mystic’s house, Playfair popped to the loo and a shaving mirror fell out of the air in front of him. ‘Inexplicable things do happen in the presence of Uri Geller,’ he said. Playfair’s research was always astonishingly detailed and scientific. For his 1999 book Twin Telepathy, he spent thousands of hours tracking down every reference on twin telepathy since the 18th century, and interviewed hundreds of twins and parents of twins. The youngest recorded examples in his book are three-day-old twins Ricky and Damien. Their mother Anne Powles recalls how, after she had fed Ricky, he started screaming and his body began to shake. She looked at Damian and saw him lying on his stomach, his face blue. It wasn’t a coincidence — Playfair found two more identical examples and attributes it to an ’empathy field’ which exerts a ‘psycho-physical’ effect. His findings convinced King’s College London’s Twin Research And Genetic Epidemiology Department, that it was an area that deserved further investigation. Guy Playfair continued his research until shortly before his death last month, on the same day as BBC Four broadcast a documentary about the Enfield Haunting. He always maintained there was no such thing as the supernatural. ‘Everything is natural,’ he would say.